Balustrade – railings – will normally have to be at least 1100mm from surface of deckboard to top of handrail. In other words 1100 high from the deck. The balusters will need to be placed close enough together, to ensure that maximum 100mm (4in) gap. i.e. a 100mm diameter sphere should not be able to pass between adjacent balusters. This also applies to the gap between to balustrade and the deck surface – a 100mm sphere should not be able to pass under the balustrade. This will apply around the whole perimeter of the deck. Our handrail is Ex 75mm x 50mm pressure treated redwood. Rebated to accept 41mm spindles. Used as both hand and base rail. are pressure treated for long lasting performance. Available from stock in both 900mm & 1100mm lengths. Treated for a longer life, our turned spindles are turned from 41mm blanks and are 895mm in length. These turned designed spindles will complement any outdoor decking project. This is one of the easiest systems to install. 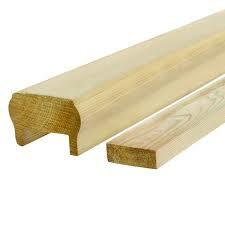 Made with 70mm x 32mm Planed rounded corner rails, With 95mm x 32mm top hand rail. Simply screw the rails to the posts and then screw the spindles to the rails and cap with the handrail. 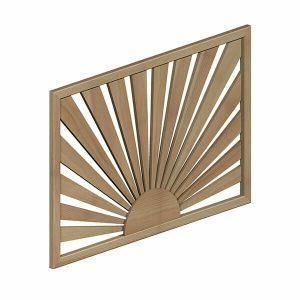 This stunning Deck Panel radiates sunshine by its fan shaped pattern, both sides of the Deck Panel are the same so it can be appreciated equally from both sides. A perfect panel for securing the perimeter of decked areas. These panels have been treated with the most upto date preservation treatment to give great protection against the UK weather while giving the finished product a fantastic coloured appearance. 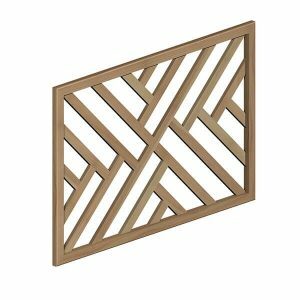 This simple and visually striking decking panel is based upon a criss cross pattern. As both sides of the deck panel are identical it can be appreciated equally from any direction, whilst the gaps in the cross pattern maintains an open aspect. This contemporary panel has the same treatment as the sunburst panel above.